The fish pond has been cleaned out, the sun has been shining, and trees are beginning to bloom. I did a little spring cleaning of my own on my terrace, by scrubbing down the walls and floors, attempting to rid it of all the pollution, dirt and dust that accumulated over the long winter months. I enjoyed my terrace for one afternoon-eating lunch, reading my books; but of course the next day it poured! 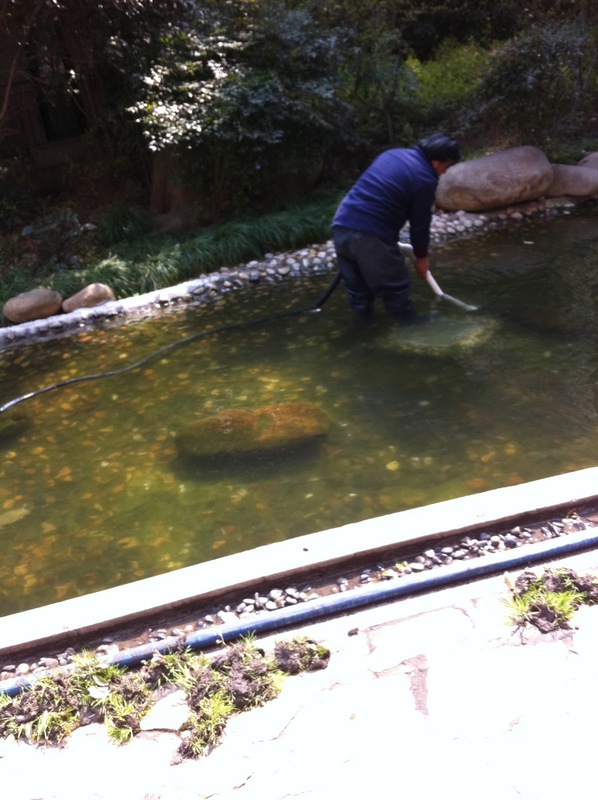 Have you vacuumed your fish pond today?! This is the almond (?) 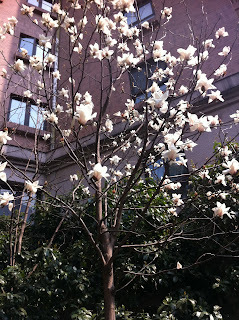 tree blossoming outside my apartment complex entrance. 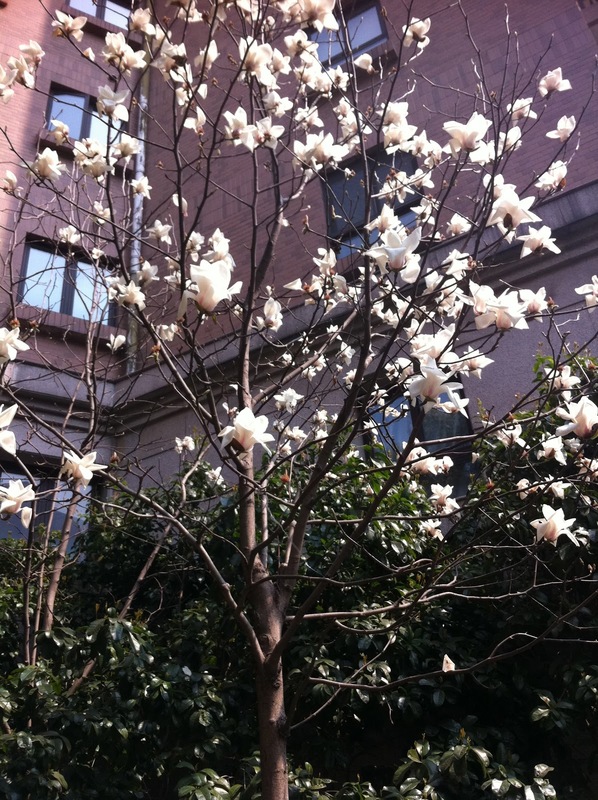 Unfortunately, these pretty blooms don't last very long, as there were more petals on the ground than on the actual tree! Since spring has sprung, it's time to spring back into shape! 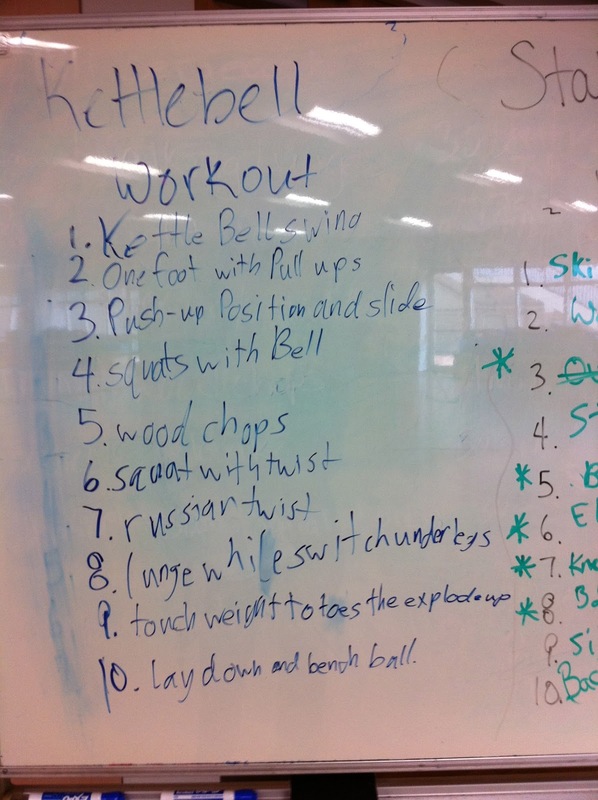 Here are some workouts my students have designed using different gym equipment such as kettlebells, bosu balls, stability balls and body bars. The students really seemed to enjoy thinking of ways to use the equipment, and work through exercises that they had found in their research. We really aimed to make the circuit training as dynamic as possible, incorporating elements like balance and crossing multiple planes of movement. 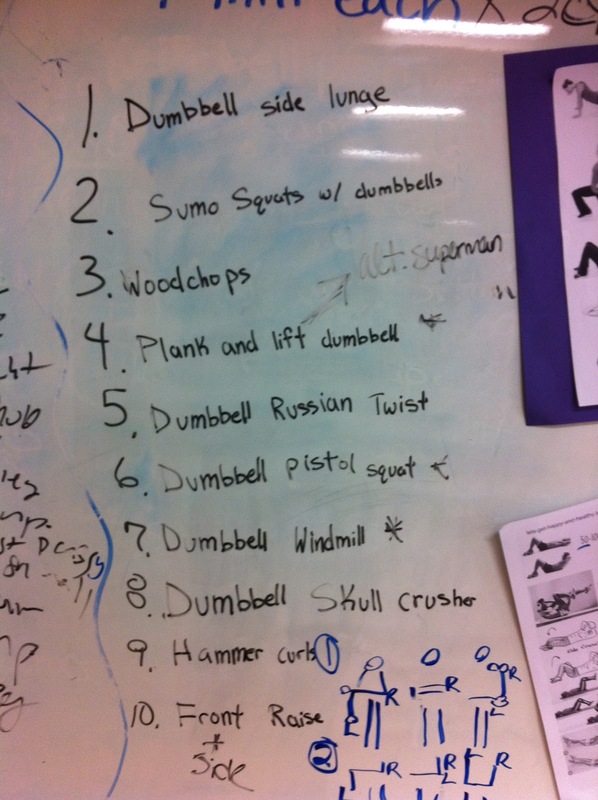 Some of the names were really random, like this gem--the dumbbell skull crusher. 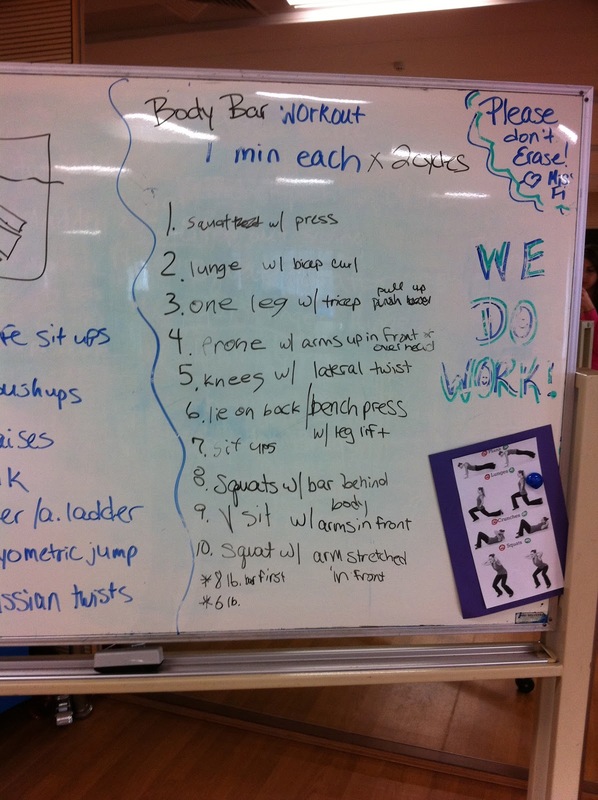 Of course when this student presented, I was nervous to see what that exercise entailed. 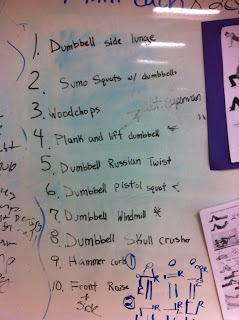 Luckily, it didn't involve bashing the dumbbell into one's forehead, as if they were crushing a soda can!! 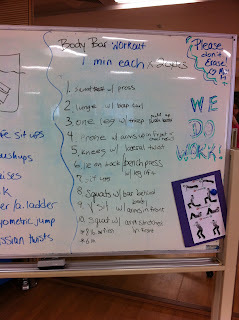 It actually was a really good workout, and this student was a great leader, constantly encouraging the group to stay with the tempo and push through. 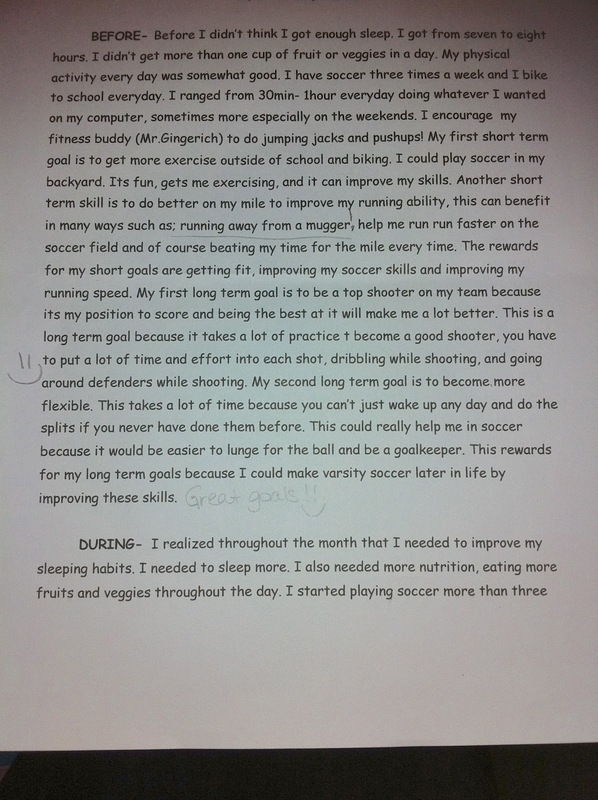 Below are some memorable reflections written by my 7/8th grade students regarding their personal fitness unit. They were faced with a month-long challenge to eat at least 5 serves of fruits and/or vegetables, get 8 hours of sleep, 1 hour of physical activity and 30 minutes or less of technology/TV time on a daily basis. 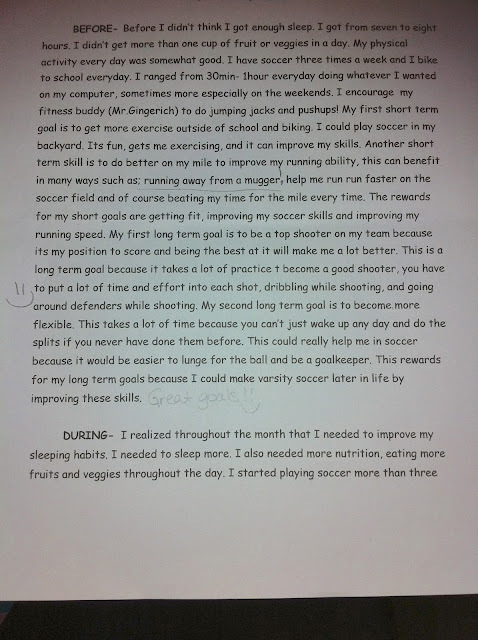 I loved reading their process behind decision making, goal setting, and achievement. 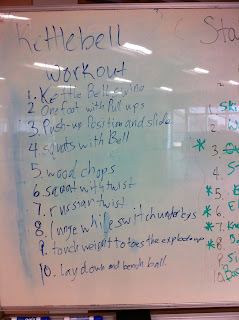 Since PE class moves so quickly, I don't have much time to get to know my students very personally. 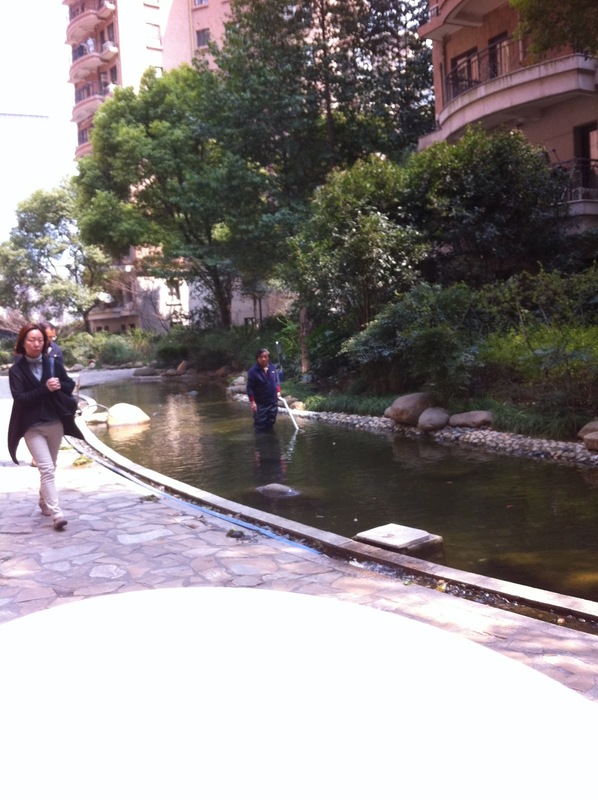 These reflections allow me a better understanding of the students I am teaching, and I am able to find new ways to reach out to them, and connect their learning to personal interests and hobbies. 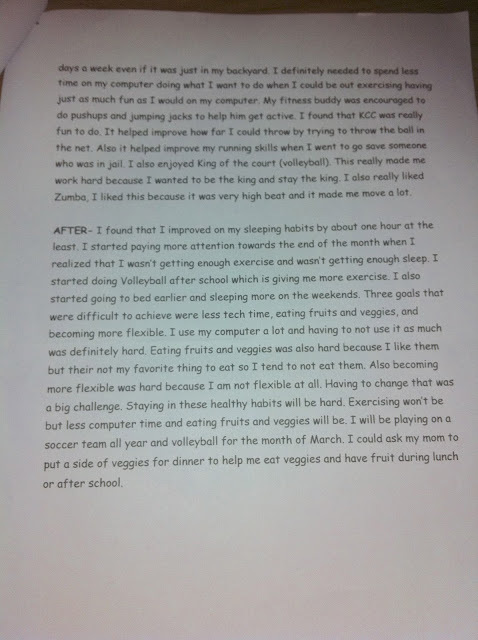 So there you have it--fitness advice from 13 and 14 year olds; that if you practice running, you'll be able to run away from a mugger, vegetables improve your digestive system's flow, and bad nutrition and lack of sleep will negatively affect your energy and performance during the day. Couldn't have said it better myself!! Here's to a healthy spring--filled with positive thoughts, daily exercise, healthy eating, staying strong, working smart, worrying less, dancing more, loving often and being happy! Have a healthy day, wherever you are in this beautiful world!